I got this great TinyMCE plugin, Ultimate TinyMCE, that works just great with WP. It does everything you want, but the most used functions for me is uploading images and inserting smileys. When you turn on the “Use the fancy WordPress editor to create and edit topics and replies” it shows up in bbPress too, but only admin can use the extra functions enabled. Take the smileys for instance. If you make a post of just smileys it tells you “ERROR: Your reply cannot be empty.”. If you write som text and include a smiley, it posts the text without the smiley. It is the same with images. What is happening? It does not matter what forumrole the user has. He can be key admin, makes no difference. Only WP Admin can post smileys and images on my forum, and I would like to change that. Does anyone know what is wrong here? You can remove “plugins” from the topic. The standard TinyMCE does not work either. Only admin can change color of the text, align right, etc. Looks like my bbPress has a general issue with TinyMCE. I’ve noticed this problem as well. When a non-Admin user attempts to post a Topic or Reply using the Visual mode (built-in TinyMCE support), they’re led to believe that they can use do things like create ordered/numbered lists, etc. The visual editor does show it, but when they Submit it, bbPress strips this out. No surprise there: while the visual Editor bar shows these editing capabilities, the little box below the editor that says “You may use these HTML tags and attributes:” doesn’t list ol, ul, li etc. Doh! I noticed that posting to this bbPress site, it shows in the little box that I can use ol, ul, li, and it does work. QUESTION: How can I expand the available HTML tags and attributes (ideally without hacking the bbPress code) to include other tags like ul, ol, li, br, hr, etc? Okay, I think I figured this out on my own, though I don’t quite have the list of usable html matching what the default TinyMCE editor offers. I’ll have to play with that separately. What I did was add a function in my functions.php file that changed the allowed markup for all bbPress (and blog) posts to include what I think is a reasonable list AND is still safe. I’ve added the IMG tag as well — for my Forum that’s a useful feature, and I’ll just have to monitor what people post in terms of image links. Yep you are definetly on to something Michael! Some of this is going to change again in bbPress 2.3, so you may want to check out the beta. I’m still having trouble with this one. I am using bbPress v2.2.4 with Twenty Twelve (tried it with Twenty Eleven also), and I am having tags stripped out. If I do ol/ul they return as a p tag with br tags separating the line. Here’s a screenshot of my toolbar for forum posting: http://d.pr/i/qjbM. 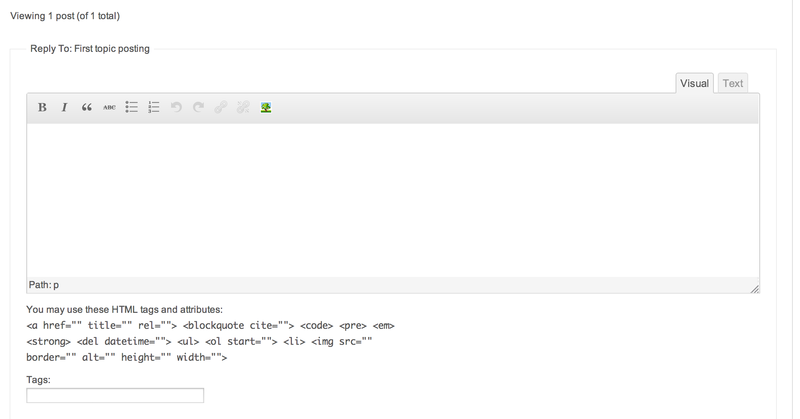 This is with “Use the fancy WordPress editor to create and edit topics and replies” checked in Forums settings. How can I get a basic formatting toolbar working correctly? Atahualpa Theme and bbpress 2.2.4 and have the WordPress Fancy editor option switched on. I tried the solution offered by @michaelhpdx but it didn’t work. Perhaps I put Michael’s in the wrong function.php? I put it in the function.php in bbpress/admin. I notice there also on in bbpress/common and perhaps it needs to go under the theme? Tried with the bbPress (Twenty Ten) Theme and the numbers & bullets show up. Try the 2.3 release candidate. It should work the way you want it to. Good call – I just switched the current bbPress 1.2 plugin (I had to rename its folder it as the beta doesn’t update it. If you try a standard install it complains that a plugins/bbpress folder already exists). Once over that hurdle, the problem of no numbers in the ordered lists and no bullets in the unordered lists is fixed. I note that only bullets appear in this forum (numbers are replaced by bullets) so its seems this forum hasn’t upgraded to 2.3 yet! It will be interesting to see what other features 2.3 brings. I’ve tried it directly activating TinyMCE from functions.php in the theme, and removing the plugin. I can write text in visual mode and forum, no problem. If I reply to another thread does not work correctante. Please, I can give my some solution?